Subtraction is the application of established properties, rules and methods to reduce the sum of numeric quantity. Simple integer subtraction only considers positive whole numbers, but the result can be negative, zero or positive. Answers can be negative, zero or positive values. 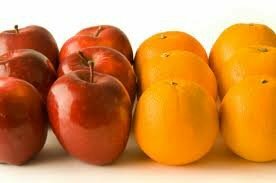 Six apples and six oranges is not a dozen of either apples or oranges. We do not sum or subtract items that are not the same. We could be interested in the total number of apples and oranges if they were combined. Like the same box or bag, to make sure the container is large enough for all items. 2 digit subtraction when one or more numbers is 2 digits. We must work with the -3 value (10 - 3) to determine the answer. When subtracting 7 from 4 (4 - 7) it results in -3 (as shown above). Recognizing the result is negative we “borrow” 1 from the nearest left column. Each 1 that is borrowed from the nearest left column has a value 10 times greater than the column that is borrowing. The ten is added to 4 resulting in the value of 14, (10 + 4). Three digit subtraction - one or more numbers is 3 digits.